On November 14, Israel murdered Hamas military commander Ahmed Jabari in cold blood. A missile struck his car. Another passenger was killed. Unconfirmed reports said it was his son. Attacks continue. Israel’s Operation Pillar of Cloud (aka Cloud Column) killed at least nine Palestinians. Over 20 others were injured. Authorities expect death and injury tolls to rise. Bombing and shelling continued overnight. At least three more Palestinians were killed. More were injured. 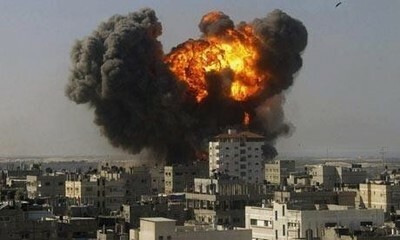 Israel said over 20 sites were targeted. Hamas’ military wing, Izzeddin Qassam Brigades, said Israel “opened the gates of hell.” A robust response was promised. Jabari is the most senior Hamas official killed since Cast Lead. He was involved in capturing Gilad Shalit. During his five years in captivity, he led negotiations that freed him. Netanyahu said Israel chose this time to “exact the heaviest price.” Initially he added that a significant military action wouldn’t be undertaken. In fact, it was initiated and remains ongoing. Perhaps something greater is planned. Hamas leader Ismail Haniyeh called on Arab states to help stop Israel’s “barbaric” assault. What may be is planned is worrisome. Defense Secretary Ehud Barak called up Israeli reserves. All options are on the table, he stressed. A ground operation may or may not follow. On November 14 at 7:37PM, the Palestinian death toll rose to seven. Another 20 others were wounded. At 7:42 PM, Shimon Peres spoke to Obama by phone. He said Jabari was responsible for “terrorist” attacks. He lied, but both sides accept this explanation. At 7:45 PM, Abbas called for an urgent Arab League meeting. At 7:50PM, Barak called for “special situation” status on the home front at a distance of 40 km from Gaza. Government approval is needed. At 7:59PM, Be’er Sheva alarms told residents to seek shelter from rocket attacks. At 8:03PM, eight Palestinian deaths were reported. Another 30 were wounded. At 8:09PM, Palestinians reported an explosion at the home of former Fatah security head, Rashid Abu Shabak in Gaza. At 8:11PM, rocket fire struck a parked vehicle in Be’er Sheva. At 8:12PM, Be’er Sheva alarms again sounded. Rocket fire was reported. At 8:17, 8:19, and 8:20PM, more rockets were fired. At 8:37PM, Netanyahu accused Hamas and Islamic Jihad of harming Israelis. At 8:40PM, Israel’s US embassy said surgical strikes showed restraint in responding to Hamas rockets. At 8:50PM, rockets were fired toward Dimona for the first time. At 9:21PM, Israeli gunboats shelled Gaza. At 9:18PM, Jimmy Carter condemned attacks on both sides. Press TV said Israeli warships fired missiles on Gaza. Egypt recalled its Israeli ambassador. Reuters said Egypt condemned Israeli attacks on Gaza. Foreign Minister Kamel Amr demanded they stop immediately. Israel’s action is the beginning of more to come. Retaliatory attacks will follow. Expect Israel to use them as justification for further strikes. Perhaps Cast Lead 2 is planned. The fullness of time will tell. Haaretz said Hamas has Fajr rockets. Their range is 75km. They can strike Tel Aviv and other urban areas. Whether this “Judgment Day” weapon will be used remains to be seen. Israel attacked 20 underground sites believed to store them. Reports didn’t claim success. It bears repeating what previous articles stressed. On January 22, Netanyahu faces reelection. Perhaps he thinks killing Gazans increases his prospects. Once attacks begin and escalate, who knows how they’ll end. Death and destruction begets more of it. The more Israel attacks Gaza, the more Arab street anger will grow. So will anti-Israeli sentiment elsewhere. Israelis perhaps approve. Jabari may be viewed as Netanyahu’s bin Laden. Expect his reelection strategy to stress it. Israel removed its main terrorist threat, he’ll say. Gullible Israelis may believe it. Opposition candidates won’t refute him. If greater escalation follows, all bets are off. War benefits often have short shelf life benefits. Netanyahu needs boosting until January 22. If reelected, he’ll worry less about approval afterwards. Blood on his hands will remain.